#MCAINDIANA: MCA is on the move. We believe in growth and movement in our communities, in our academics, and in our students’ lives. MCA provides a Christ-centered educational opportunity for families with children in grades K3 through 8th, emphasizing exemplary education taught from a Biblical worldview. We believe the partnership between MCA and our families is invaluable to the community atmosphere of our school. Every school year our MCA families commit to 20 hours of volunteer time, which serves to strengthen our school community. MCA was founded in 1975, with the belief that we can help you attain the goal of raising a child that seeks God’s plan for their life and helps equip them to achieve an outstanding education. From service to academics, our student body is well rounded and full of life! 100% of MCA students use technology in the classroom. 96% of all 5th-8th grade MCA students participate in athletics. 85% of our middle school students participate in one of the following core art programs as an elective: vocal choir, band, art, drama, or broadcasting. 100% of 5-8 grade students serve 10+ hours in our community per year. 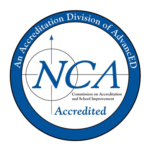 MCA is the foundation for imaginative, innovative, and dynamic education. At MCA we believe that while excellent academics are of the utmost importance, the foundation of education is in community. It’s about people, passion, and working together to create a better world. Our students have invaluable opportunities both in the classroom with a 15-1 student-teacher ratio, and outside of the classroom through top-notch sports programs, leading arts programs, community service and volunteer projects, and extra curricular activities. We are continuously amazed and always grateful for our MCA community as they help our students discover the foundations of learning. Check out the link below to see how you can get involved with MCA. Whether through donation of dollars, time, or talents, we can’t wait to welcome you to the community. Go Eagles! See How You Can Help Now. I went to this school for many years and I loved it! I still go back to visit with teachers and younger friends. The teachers and staff are so nice and really try to help every student. The academics are quite high, especially compared to some of the public schools nearby. It is a small school, but new students fit in well. I had many friends who were new in the later grades and they made lots of friends quickly and I'm still in touch with them. I love this school and still miss its atmosphere sometimes! I couldn't have asked for a better PreSchool program for my daughter, Every morning was smiles and friendly faces... I absolutely love Mooresville Christian Academy and adore Mrs.Martin she's AMAZING.. Wonderful families and staff! Very supportive! Creative, loving teachers. Fun, caring atmosphere. Caring for each other and others in need. So proud to say this is where my children attend school. From the moment you walk in and are greeted by the office staff you are made to feel welcome. Class sizes are small, teachers are knowledgeable, and students are friendly.